This application was deeply offensive and should not have been approved for distribution on the App Store. When we learned of this mistake, the app was removed immediately. We sincerely apologize for this mistake and thank our customers for bringing this to our attention. 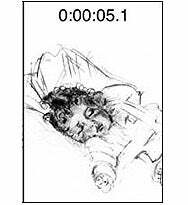 The application featured a drawing of a baby accompanied by audio of a baby crying; the goal was to shake the phone until the baby stopped crying. Some groups have called the application offensive, especially in relation to the dangers of Shaken Baby Syndrome. Defenders of the program, meanwhile, have said the application is clearly humorous in intent. Okay, so maybe the Baby Shaker iPhone app was a bad idea. You should never shake a baby! Even on an Apple iPhone Baby Shaking application. No babies were harmed in the making of Baby Shaker." The site goes on to feature a description of the dangers of Shaken Baby Syndrome. Apple’s uneven and obscure approval process has been a matter of dispute and discussion since the App Store’s debut last July, though the questions have often revolved more around apps that were rejected from the store rather than those that Apple erroneously let through.